On a day after I teach and then practice yoga, I like to come home midday and make myself a big, elaborate pasta lunch. 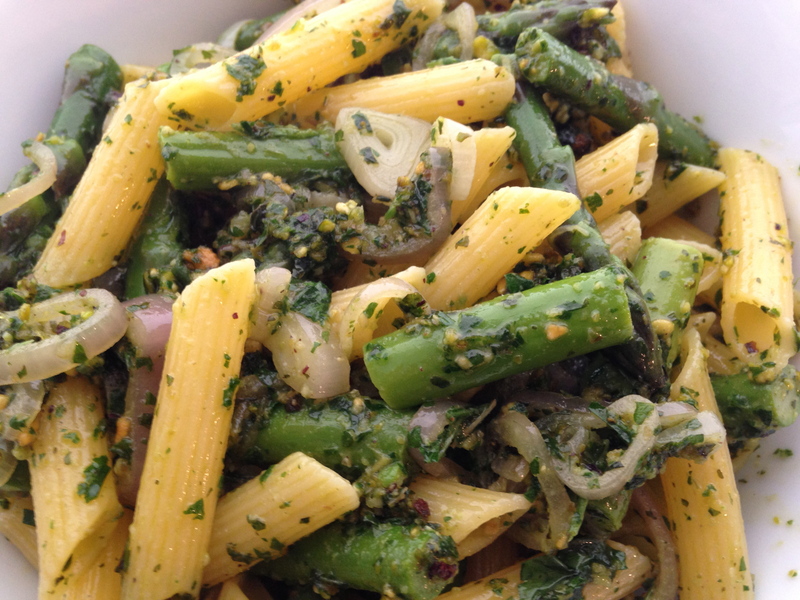 This is one of them: a delicious pesto tossed with fresh asparagus! This makes more pesto than I need for this dish so I will be using the leftover for tofu scramble tomorrow. Make the pesto by placing all ingredients in the food processor and combining. Set aside. Boil water. You will use this to blanche the asparagus and make the pasta. Set up the ice bath by filling a bowl with ice cubes and cold water. Break off the bottom tip of the asparagus and then cut into penne sized pieces, about thirds. Drop into the boiling water and blanche for 3 minutes (exactly 3, set a timer.) Remove the asparagus with a spider strainer and drop into the ice bath to stop the cooking. Lay the aspargus on a kitchen towel to dry. Add the penne to the water and cook until al dente. Thinly slice the shallots and sauté in olive oil and a dash of salt until soft. Add the asparagus to heat through. Add the pesto and mix with the asparagus and shallots Then, add the penne and combine well.